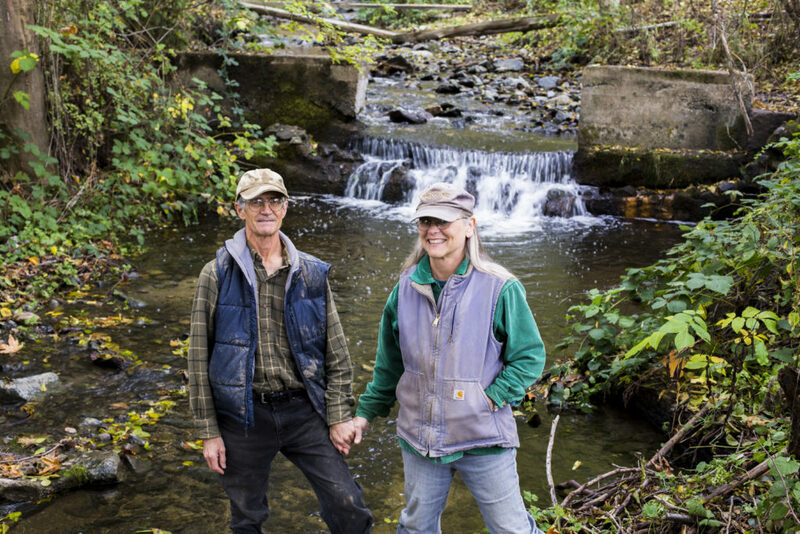 Central Point, Ore. – November 29, 2016 – Today, the William and Flora Hewlett Foundation and Resources Legacy Fund announced the creation of the Open Rivers Fund to support local efforts to remove obsolete dams and restore watersheds across the western United States. The Open Rivers Fund, which is a program of Resources Legacy Fund supported by a 50th anniversary grant from the Hewlett Foundation, will make inaugural grants to the Rogue River Watershed Council and Rogue Basin Partnership to pursue river restoration, dam removal, and infrastructure modernization in the Rogue River Basin over the next ten years. The Beeson-Robison diversion dam is a prime example of future project focus of these groups. Beeson-Robison is a 5.5-foot diversion dam on Wagner Creek in the Bear Creek sub-basin, near Talent, Oregon. The diversion completely blocks upstream fish movement from April through October. Although stop logs are removed during the winter (when adult steelhead and coho salmon are moving upstream), a 3-foot-high leap through fast flowing water limits successful fish passage to about four miles of the creek. The Rogue River Watershed Council is working with the irrigators who receive water from the diversion to remove the small dam and install a re-profiled stream channel to maintain irrigation water diversion. The Rogue River Watershed Council and Rogue Basin Partnership are working with landowners and local partners in this effort. Grants from Resources Legacy Fund through the Open Rivers Fund will support the Rogue Basin Partnership’s project coordination and communications and outreach capacity and the Rogue River Watershed Council’s capacity to engage landowners, advance project design and permitting, and remove and upgrade the Beeson-Robison diversion dam. “I support replacing the old Beeson-Robison diversion dam. It will help address the issue of fish passage and allow fish to reach cooler water during lower summer streamflows,” said Robert Hackett, an irrigator served by Beeson-Robison ditch. Resources Legacy Fund’s Open Rivers Fund is the largest philanthropic fund dedicated to dam removal and river restoration. It will provide resources to communities that are working to get dam removal and infrastructure modernization projects off the ground and will reduce cost barriers for these projects. Read the Rogue River Basin project fact sheet. The Rogue River Watershed Council is a 501(c)(3) non-profit organization that works to restore instream and streamside habitat, improve water quality, and encourage community members to become stewards of the Rogue River and its tributaries. The council covers approximately 1,641,000 acres from the headwaters near Crater Lake to Mule Creek and encompasses the towns of Grants Pass, Merlin, Shady Cove, Eagle Point, Butte Falls, Central Point, Jacksonville, Phoenix, Talent, Medford, and Ashland. The Rogue Basin Partnership is a coalition of more than twenty natural resource organizations that are working collaboratively on restoration projects throughout the entire 3.3 million acre Rogue River Basin. Rogue Basin Partnership is focused on coordinating an integrated approach to restoration, through planning, project prioritization, and coalition coordination.